I write to you because like so many fellow citizens, I am both angry and anguished. I am aware that a missive from someone like me – “Internet Hindu”, “Social Media troll” , “hyper nationalist communal sanghi” and worst of all, “Modi toadie” – will be most likely junked by you as not worthy of your time. While I read through your open letter, I struggled to understand why you felt the need to quote your “illustrious career” trying to prove your patriotism. Something against which, your entire article is based. However, the career milestones stated by you, have been countered time and again. From 26/11 coverage, to Kargil to Pathankot. I wouldn’t go on as I’m but an ordinary citizen and I certainly wouldn’t want you to get offended enough to pull a Chaitanya Kunte on me. ‘The Home Minister went so far as to link students to the dreaded Lashkar terrorist Hafiz Saeed, based on a police endorsement of a fake Twitter account”. I tried extremely hard to find a reason as to why the said twitter account of Hafiz Saeed was fake. I found none, except that account no longer existed and that the dreaded terrorist, Hafiz Saeed (who also denies his roles in the 26/11 terrorist attack) said he made no such statement. I find it quite staggering how you, as a journalist, are more inclined to believing the explanation provided by a Pakistani terrorist and not your own police force. However, since I personally don’t have any proof as to whether that account was fake or real, let us assume your premise is true and that the account quoted by the police force was fake. Is it so unbelievable that a terrorist who orchestrated a deadly terrorist attack on Indian soil would agree, even endorse “Bharat ke tukde honge, Inshallah Inshallah” slogans raised at JNU? Well, if it is unbelievable to you Barkha, you should perhaps watch the statement issued by Pakistan Foreign Office spokesperson Mr. Muhammad Nafees Zakria who said extended his support the sloganeering JNU students by saying “Kashmiris never accepted the unfair trial of Afzal Guru”. 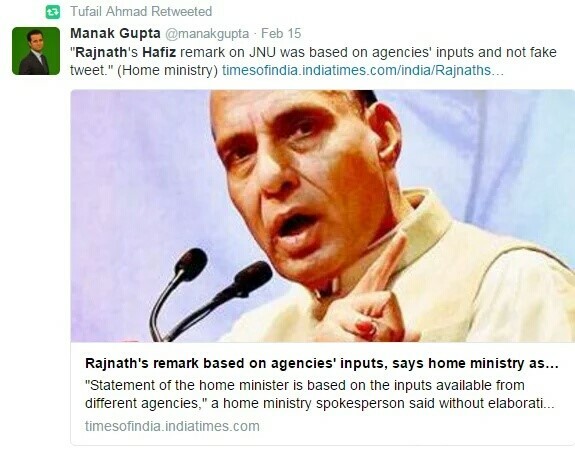 Further, Rajnath Singh never mentioned that his statement was based on a tweet, and later the HMO even clarified saying that his statement was based not on the tweet plugged by the police, but on specific intel inputs. I wonder if you didn’t know about his clarification, or you just chose to ignore it. “Not just have we not seen any evidence of terror links, but it now appears that the video used to slap sedition charge on Kanhaiya Kumar, the JNU student leader, has been doctored, with the audio spliced onto images from a different day”. Now here is where my admiration lies for your skills of obfuscation and how brilliantly you weave two lies into one to make it sound like an irrefutable truth. When you talk of “No terror links”, you conveniently forget to speak about Umar Khalid and focus on Kanhaiya Kumar so as to paint the entire crackdown on JNU elements as not only unsympathetic and motivated, but fascist. Umar Khalid is said to have links to the JeM. He reportedly called Bangladesh, Kashmir and the Gulf countries several times in the week preceding the 9th February events. There was even a UPA report about how DSU is the front organization for Maoists and it was discussed extensively on the “hyper nationalist” channel, Times Now. Umars father was the ex chief of SIMI who had said “Taliban was attacked without evidence” and “If there exists an outfit called LeT, I have not come across it”. Umar himself had written about how the ban on SIMI (Students Islamic movement of India) should be lifted. (SIMIs stated objective is “Liberation of India from western materialistic cultural influence and to convert its Muslim Society to live according to the Muslim code”). There are many such IB inputs regarding Umar Khalid’s terror links that other “hyper nationalist” channels have been talking about incessantly. So for you to say “We have seen no evidence of terror links” with respect to Kanhaiya Kumar, and to complete ignore the terror links of Umar Khalid reeks of either unimaginable ignorance, or a desperation to prove your misplaced point with regards to the JNU crackdown by muddying the pool of truth. In any case, why are you so desperate to conduct a media-trial and exonerate all the accused? The second part of the blatant lie is that the sedition charges that were slapped on Kanhaiya, are based on the doctored video that emerged later. 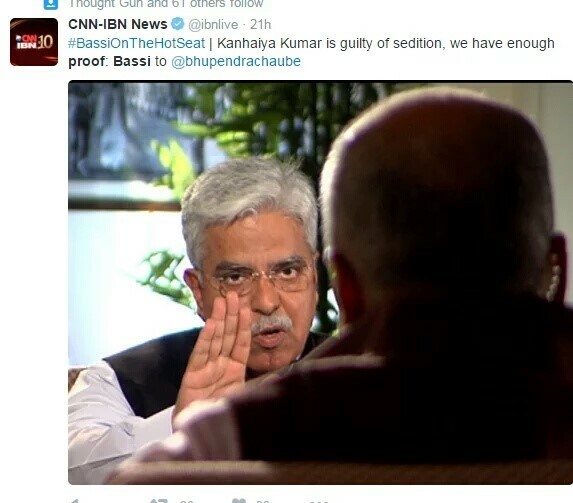 The only statement that was made by Mr. Bhim Bassi is that Kanhaiya Kumar is guilty of sedition and that the police has enough proof. Hence, your assumption, is baseless and seems extremely motivated to garble the entire debate around the JNU issue. Somewhere in that consortium of lies that you call an article, Barkha, you write that in a country like ours, where even Kasab got a fair trial, Kanhaiya was slapped around in court in the presence of police that failed or perhaps refused to protect him. Again, I applaud your remarkable talent to intertwine an established fact with a blatant lie to present a half baked fallacious statement that at best, only serves your personal agenda and skewed narrative. Yes. Kasab was hanged to death after a fair trial. A fair trial that began after he was arrested by the police and the charges were framed based on evidence available. That, Barkha, is the standard procedure. It’s funny how you talk as if Kanhaiya has already been convicted without a trial, when right now, he has only been arrested based on evidence with the trial yet to commence. The second, ridiculous lie in that statement of yours, is that the police refused to protect him in court. 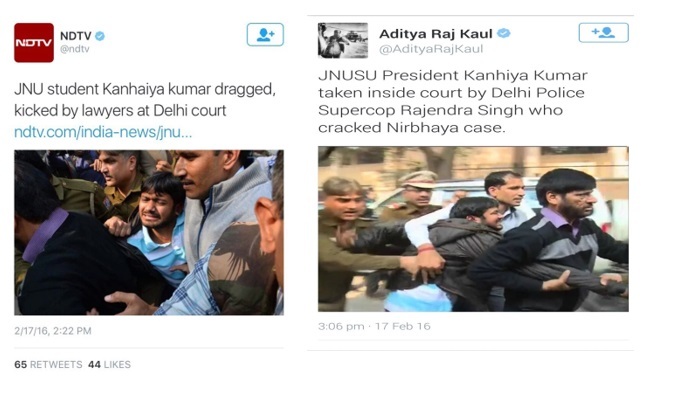 What you and your channel NDTV called “dragged and kicked by lawyers” was actually super cop Rajendra Singh escorting Kanhaiya to court safely. To jog your memory, Rajendra Singh is the same super cop who solved the Nirbhaya case. 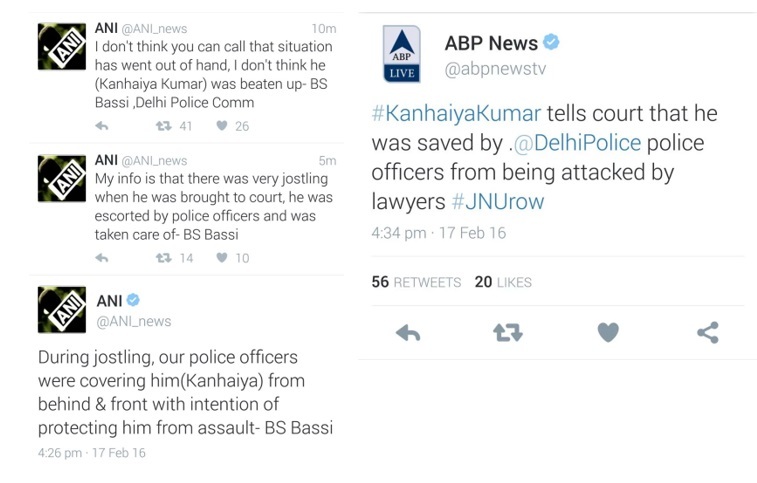 You refused to report facts even after Mr. Bassi issued a clarification. You still choose to peddle the same lies after Kanhaiya’s statement lauding the Delhi police. Right after you write about how since the slogans were against “Mother India” and mothers are benign and forgiving, the state shouldn’t be heartless towards seditious elements and forgive her children, you go on and on about how goons at the Patiala court house assaulted journalists and that the state did not take action. My only concern here, Barkha, is how easily you expect the state to be forgiving and empathetic towards elements that show solidarity with a terrorist who orchestrated the attacked the symbol of Mother India’s sovereignty, the Parliament, but in the same breath demand the sternest action by the state against a handful of out of control lawyers who evidently assaulted journalists. The law should take its course in both cases. Which it is by summoning the lawyers and by arresting Kanhaiya Kumar and looking for Umar Khalid (who is on the run) for their respective crimes in accordance with the law. You however, demand leniency and forgiveness for one (Anti state elements) and stern action against the other (out of control goons). The “heartlessness and hypocrisy” you lament, dear Barkha, is yours. Not the state’s. There is a point in your “article” where you talk about how the “rowdy in robes are free” while the innocent students are being questioned about the whereabouts of Umar Khalid, calling the acts of the lawyers “anti constitutionalism”. Barkha, the acts of hooliganism of the lawyers is certainly against the law, and action in accordance with the Indian Penal Code must be taken. But you fail to realize that it is within the ambit of the law for the police to try and find an absconding criminal wanted by the law agencies. The fact that the police is questioning Umar Khalid’s friends, is also standard procedure as per the law. Of course, it’s not a trolls business to teach the law to Varishth Patrakars like yourself, but when the keepers of facts start blurring the lines between truth and fiction, it becomes necessary. Barkha, on 16th February, the “hyper nationalist” channels reported how a high powered enquiry panel of JNU had found Kanhaiya Kumar guilty in the anti-India event case of February 9th. A Times Now report said how 8 students had been suspended and 5 students are still on the run. Now, considering you trust panels constituted by the varsity more than evidence collected by the police, if the panel constituted by the varsity itself had found Kanhaiya guilty, your entire premise falls flat and your demands for the cases against Kanhaiya being withdrawn are rendered useless. Your entire article, Barkha, is a maze of misrepresentations and contradictions. It is a conundrum as to whether you want the state to follow the law or be benevolent. You seem to advocate state action when it suits your narrative and propagate benevolence and forgiveness when it doesn’t. You wanted the state to leave it up to the university to take action against the students who threaten the sovereignty of the state, but propagate heavy handed action by the state against rogue lawyers who turned rowdy outside Patiala Court. You seem to hail the “peaceful march” held by other JNU students in support of fellow students charged with sedition, but black out March For unity by citizens and condemn a peaceful march held by lawyers in support of some other lawyers charged with causing hurt. You lament how PM Narendra Modi maintained his silence on Dadri (a state law and order issue), and Rohit Vemula suicide (a university issue) and equate it with his silence on the JNU issue where your initial premise is that the state shouldn’t be involved at all. If you think the state shouldn’t be involved in the JNU sedition issue, then why would the PM speak, Barkha? And if you thought the state should have got involved in Dadri and Rohit Vemula suicide, why would you propagate that the state should not get involved in a much more serious issue like sedition? You write, Barkha, that thought cannot be policed. Yet, you held the state responsible for a suicide, an extreme action which is a product of one’s extreme thoughts. You say that Nationalism cannot be regimented and that it’s for every Indian to define for herself. You said you were ashamed as an Indian at the Patiala Court incident. Yet, you insult citizens like me as “hyper nationalists” when we take severe offense to a bunch of seditionist goons demand “bandook ke dum par azaadi”, “bharat tere tukde honge, Inshallah” and “Afzal tere armano ko manzil tak pahuchayenge”. You went hammer and tongs against the lawyers when they questioned the nationalism of journalists. Yet, you suggest that citizens like me taking offense to anti national illegal slogans that call for the destruction of India’s sovereignty fall under the purview of freedom of expression. You suggest the state follows the law and takes action against rogue lawyers, even for slogans raised, But conveniently forget limitations to freedom of speech that rescind the freedom when it comes to protection of the sovereignty and integrity of the country. You label the JNU protests as rebellious, non-conformist and anti-establishment. If you truly believe the premise you have spelt, it is tragic how misinformed you are. If you don’t, I applaud your insatiable capacity for motivated and dangerous propaganda. You fail to draw a difference between the lack of action against anti-establishment protests (however despicable) and anti-state intentions. Afzal Guru was a terrorist, tried and hanged to death for the attack on Indian Parliament. The parliament, is the symbol of democracy and sovereignty of any country. When Afzal Guru attacked the Parliament, he attacked the very existence of our great democracy. When students want to fulfill the wishes of “martyr Afzal Guru”, they essentially want to the sovereignty and integrity of the nation to be reduced to dust. THAT, Barkha, isn’t rebellious or anti establishment. Thank you for this informed and balanced opinion after a long and tedious spider web of lies and false equivalences. Yes. Sedition charges are valid only when the sloganeering is accompanied by an incitement to violence. I’m sure as a reasonable person, you would agree that slogans like “bandook ke dum par azadi” and “Afzal tere armano ko manzil tak pahuchayenge” certainly, incite violence. I urge you Barkha, to pursue the principles of satyam, shivam, sundaram in your journalism. I urge you, to report facts. I urge you to not malign the glorious sentiment of nationalism. I urge you, to not blur the lines between immorality and illegality. Barkha, India belongs to its citizens who love her dearly. The tricolor is in our hands. And so is our future.